My team loves crap can racing, but doesn’t love partying in a dirty crap can paddock or sleeping in a dirty crap can tent. Then the solution appeared. 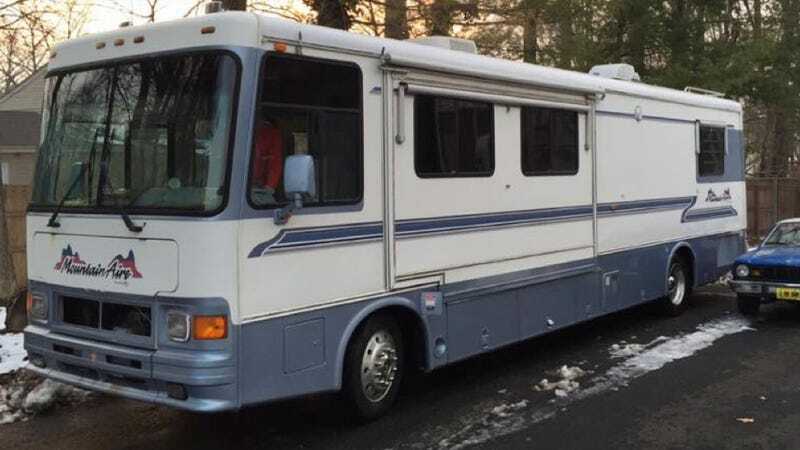 Thanks to a little website called Copart and people with a lot of time on their hands, we got a $200,000 RV for $4,000. Here’s how it’s done. In 1995, if you wanted a Class A Diesel Pusher RV, the “Newmar Mountain Aire” was as good as it got. At nearly 40 feet long, with a chassis by Spartan, it boasted unparalleled space, comfort, reliability, and elegance for about $170,000. Upgraded, you could get it with a monster 8.3 liter Cummins turbo-diesel six and a bulletproof six speed Allison transmission. Springing for all the options got you better AC and heat, fancy appliances and lighting, a full size tub and shower, superior furniture, remote control everything, a heavy duty rubber roof, and real hardwood floors. All at a price tag of about $200,000. A brand new Mountain Aire now runs about $418,100, although, on sale you might find one for $294,000. The chassis, motor and amenities aren’t much different than the 1995 version, but today’s model has GPS (of course, so does your phone), and fixtures, furniture, and finishes that are more evocative of 21st century Las Vegas, than late 1980s Miami Vice. Today, a good low mileage twenty year old example will set you back about $40,000. How then, in 2015, did Rally Baby Racing manage to get it’s grease stained mitts on an optioned-out, classic, one-owner, rock-solid, no-leaks, no-mildew, just a few mouse nests, low mileage (52k) 1995 Newmar racetrack-mobile- headquarters/party bus/tow vehicle, for about ONE PERCENT of its original price? Just kidding, we’re idiots who occasionally get lucky. Because we can be prone to big expensive mistakes, and we sensed this might be our biggest yet, we dubbed it the “RBR Blunderbus.” But we’re getting ahead of the story. It seems that a pleasant elderly couple bought the RV new, and then used it for a few years traveling around the country to dog shows (dog show people seem to love these things). Then it sat for a while – thirteen years is our best guess – the carpet faded, and the décor fell victim to changing tastes, and lichen grew on the roof. At some point, as best we can figure, its owners decided to part with the vehicle. They donated it to charity, presumably taking a hefty tax write-off for this fine machine. The coach found its way to Copart, which, if you’re not familiar, is a primarily on-line auction house which sells a lot of cars, most with heavy accident damage. If you’re buying, you need to go in with your eyes wide open – there is not really any way to know what you’re getting, and once it’s yours you cannot take it back. In other words, know what you are doing or steer clear. By the middle of the brutal winter of 2015, the Blunderbus was in a Copart sub-yard not far from Rally Baby Racing’s Doylestown, PA home base. With that guidance, the guys took a few jump boxes and charmed the yard staff into letting them attempt to confirm that the motor would in fact turn over - it did – and that was all we would know, other than that under the piles of snow, and beneath the grime accumulated from sitting under trees for over a decade, the bus didn’t appear to be too bad. At the appointed hour, on a Friday morning in January, the bus crossed the on-line auction block. Several of us had obtained Copart memberships so we could watch the action. We had studied the myriad complicated, interconnected, and likely deteriorated mechanical, electrical, hydraulic, and pneumatic systems; evaluated the costs of resuscitating the slumbering beast without knowing what it might possibly need; carefully weighed the immense risks against the (likely minimal) return; and, most importantly, obtained a value for the bus as scrap if all else failed. With that info, we settled on our maximum bid. We gave the job of actually handling the bidding to Joe (because without a designated bidder we’d likely do something stupid, like bid against one another). Joe handled the auction brilliantly. We were the only bidder and won with a minimum bid of $1,000. We awaited confirmation that we could bring our money and pick up our bus. Nothing. Joe explained that there were a few types of Copart auctions and that notwithstanding the fact that no reserve had been established, that sometimes a seller had a right to declare a “no sale” if they were not happy with the high bid. A week went by and the bus was relisted for an auction taking place on Thursday night at 9 p.m. It is our assumption that Copart was hoping that potential purchasers would be drinking. Again we were the only bidder and again the bidding stopped where it started at $1000. Again we awaited word that the bus was ours and again we were disappointed. Nothing. We had started to get enthusiastic about the project and the adventures that lay ahead as evidenced by our cart-before-the-horse creation of a Facebook Group to track the build. Copart relisted the lot for a third time, and again we bid. This time some prick from Ohio bid against us driving the bidding above $2000, but again we won with a bid of $2150. We were not optimistic that this auction was finally over, and Joe explained that, if we were lucky, Copart might counter. A few days later he got the email, asking us if we were willing to up our bid a by few grand. Disillusioned, and feeling like we were entitled to the damn thing at this point we decided to stay with our final bid. Our astute negotiation tactics were effective. Moments later we were told that the Blunderbus was ours. We paid the price and fees, arranged for a six mile $400 heavy tow and brought her home. Three hours later, with a few new filters, batteries, belts and hoses, and with ancient diesel drained and replaced, we turned the key. Long dormant electrical systems, HVAC, appliances and plumbing begrudgingly came back to life and she fired up, settling into a healthy roar, reminiscent of a city bus. A few leaky turbo coolant lines, and a few cracked wires later, we had ourselves a legit RV, really needing only insurance and new tires, which will cost us the most. But we’d rather spend more on tires than have a catastrophe on the interstate. We’ll replace the furniture, give it cosmetic once over and fashion some bunks and by the time we’re done it should be gorgeous and mechanically solid for well under $10,000. That’s how you bring budget racing know-how to an actual practical application. Racetrack adventures to follow – come say “Hi” and party with us on the Blunderbus at Palmer, Mid-Ohio VIR and Summit Point over the next few months.